The IL-10 gene and homologs IL-19, IL-20, and IL-24 are expressed within a highly conserved 145-kb cytokine gene cluster. Like the Th2 IL-4 cytokine gene cluster, it is feasible that there is coordinate regulation of these cytokines by distal regulatory elements spanning the locus. We initiated a search to characterize regulatory elements within the IL-10 family locus and present data herein on a conserved 40-kb region between the IL-19 and IL-10 genes. We map the location of 17 DNase I-hypersensitive sites in different murine T cell populations and identify three enhancer elements, which function in T cells in vitro. Two of these enhancer elements, located 9 kb upstream and 6.45 kb downstream of IL-10, display cell-specific function in the Th1-Th2 cell clones AE7 and D10 and also exhibit basic promoter activity. The downstream element, IL-10CNS+6.45, binds AP-1 in the absence of NFAT and expresses intergenic RNA in a Th2-specific manner, further validating its role as a Th2-specific enhancer/promoter element. We show that the five most highly conserved noncoding sequences in the 40-kb region transcribe intergenic RNA; four of these regions possess promoter activity in vitro that could account for the expression of these transcripts. Hence, we speculate that these novel regulatory elements in the IL-10 family gene locus function via an intermediate regulatory RNA. With the expanding repertoire of cytokines cloned in recent years, it became apparent that many, such as IL-10 and its novel homologs IL-19, IL-20, and IL-24 (reviewed in Ref.1), are encoded within cytokine gene clusters. Considering this common feature, it is likely that mechanisms of gene regulation that coordinate the concomitant or exclusive expression of cytokines within a locus, or even spanning cytokine loci on different chromosomes (2), are also shared between cytokine clusters. The IL-4 Th2 cytokine cluster is regarded as a model for transcriptional analysis but mechanisms of gene regulation within the IL-10 locus have been largely neglected despite the central role of this cytokine in immunity. Studies on the IL-4 locus have indicated that critical regulatory elements lie at considerable distances from the gene and within introns of other genes. Hence, we chose to investigate whether there is a role for distal regulatory elements in coregulating IL-10 and its adjacent cytokines IL-19, IL-20, and IL-24. IL-10 and it homologs IL-19, IL-20, and IL-24 (reviewed in Ref.1) are encoded within a 145-kb cytokine gene cluster on chromosome 1 in humans and mice. IL-10 plays a central role in suppressing cell-mediated immunity (reviewed in Ref.3) and is required for the development and function of several T-regulatory cell populations (4). Its homologs exhibit variable function (1), although all but IL-24 have been implicated in the autoimmune disorder psoriasis. Furthermore, polymorphisms throughout the IL-10 family gene cluster (5, 6, 7) have been linked to autoimmune, malignant, and infectious disease susceptibility, but the mechanisms by which the polymorphisms affect gene transcription are currently unknown. Until recently, most transcriptional studies performed in the IL-10 family locus had focused on the cytokine promoters. In addition to polymorphisms reported in the human gene, the promoter for IL-10 contains a polycytidylate tract polymorphism in different strains of mice (8), which might account for differences in expression levels. Functional Sp1 sites mediate activity in the human (9) and murine (10) IL-10 promoter. IFN regulatory factor 1, STAT3 (11), NF-κB (12), CREB, activating transcription factor, C/EBP (13), c-Maf (14), and reportedly IL-1 receptor-associated kinase 1 (15) also bind the IL-10 promoter sequence. Both SMAD and GATA3 transcription factors can induce IL-10 expression in T cells (16, 17), and AP-1 and C/EBP have been implicated in IL-24 promoter function (18). Recently, Im et al. (19) identified seven DNase I-hypersensitive sites (HSS)3 spanning the IL-10 gene, and Wang et al. (20) characterized two additional HSS downstream of these. However, evaluating locus-wide regulatory elements is a critical step in understanding IL-10 family gene regulation, because new evidence suggests that in the β-globin gene and IL-4 cytokine clusters, distal regulatory regions physically interact via DNA looping to form an active transcriptional domain or chromatin hub (21, 22). In this model, the hub is present and poised for gene transcription, but it is the active recruitment of gene promoters into the hub, which initiates gene expression. A similar phenomenon may occur in the IL-10 gene cluster. We initiated a broad-based search to discover distal regulatory elements in the 145-kb locus. In addition, we questioned whether the regulatory sites transcribe noncoding or intergenic RNA in the locus because of emerging evidence implicating RNA in gene regulation. Intergenic transcripts were detected in both the β-globin and IL-4 locus (23), but their functional role is unknown. In this study, we characterize 17 HSS using empirical and bioinformatic data and identify functional transcriptional elements that act in a Th1-Th2-specific manner. We also find that intergenic transcripts are detected in regions of very highly conserved sequences, which exhibit basic promoter activity in vitro. These studies are the first to identify functional enhancer elements in the IL-10 family locus that might function through expression of regulatory RNAs. BALB/c and C57BL/6J mice were purchased from The Jackson Laboratory and maintained in the Yale University Animal Resources Center. D10 and AE7 T cell clones were maintained as described previously (24). J744 cells were cultured as instructed (American Type Culture Collection). CD4+ T cells were purified (>95% pure) from murine spleens using Miltenyi CD4 beads according to the manufacturer’s protocol (Miltenyi Biotec). Early experiments demonstrated that results were comparable with or without further sorting for naive cells. Because large numbers of cells were required for these analyses, we did not deem it necessary to sort for naive cells except when preparing RNA for PCR experiments. CD4 cells were analyzed or cultured in vitro under Th1 and Th2 conditions as previously described (25). When indicated, cells were activated with PMA (50 ng/ml) and ionomycin (1 μM) for 4–6 h. Bone marrow-derived macrophages were prepared according to standard protocol using M-CSF-rich conditioned medium from L929 cells. Precursor cells were plated at 10 million cells/ml and cultured in vitro until confluent, then activated with LPS at 50–100 ng/ml. Cells were evaluated by FACS staining for Cd11b, CD11c, and CD80/CD86 expression to confirm their activation status and purity. Cells (>98% CD4+) were separated on a Ficoll gradient to remove dead cells. All cell cultures were tested for cytokine expression using RT-PCR and intracellular cytokine staining to confirm T cell phenotype. DNase I hypersensitivity analysis was performed according to previously published methods (26) including RNase treatment. T cells were lysed in the presence of 0.25% Nonidet P-40. J744 cells and primary macrophages were lysed in the presence of 0.5% Nonidet P-40. For each experiment, a DNase I titration of 5–10 different concentrations ranging from 1 to 30 μg/ml with 10 million cells per sample was used, although not all these are displayed in Results. In some experiments, HSS from endogenous DNase activity were evident in the no DNase control, but these were not always present, indicating the the bands were specific products of DNase I digestion. Each probe was tested with genomic DNA and proved to bind specifically to a single parental band in the absence of DNase I.
Spleen CD4+, Th1, and Th2 cells were activated with PMA-ionomycin for 6 h before performing CD4 surface and intracellular cytokine staining according to the manufacturer’s instructions (BD Biosciences). RNA was extracted using TRIzol reagent (Invitrogen Life Technologies) and treated with DNase I using the DNA-Free kit from Ambion to remove residual traces of genomic DNA. Reverse transcription was performed on 1 μg of total RNA using Superscript III and random primers (Invitrogen Life Technologies). However, for the detection of intergenic RNAs, 2–4 μg of total RNA were used, because these transcripts are present at low levels. All cDNA reactions were performed with or without reverse transcriptase to identify any genomic DNA contamination that could yield false PCR positives with nonexon-spanning intergenic primers. Semiquantitative RT-PCR was performed using standard protocols with exon-spanning primers for the IL-10, G3PDH, hypoxanthine phosphoribosyltransferase (HPRT), and IL-19 genes. Real-time PCR was performed using exon-spanning primers for HPRT and IL-10 with fluorogenic probes (Biosearch Technologies) according to standard procedure (40 two-step cycles, 60°C annealing on an iCycler IQ machine; Bio-Rad). D10 cells were resuspended at 5 million per 0.4 ml of serum-free medium, electroporated at 250 mV, 960 μF with 20 μg of DNA, then cultured overnight in serum-containing Bruff’s medium. In all experiments involving AE7, 10 million cells per sample were electroporated at 400 mV, 960 μF with 40 μg of DNA (both AE7 and D10), and IL-2 at 50 U/ml was added to the Bruff’s medium. The next day, cells were activated with PMA-ionomycin where indicated and assayed with the Dual Luciferase Reporter kit (Promega). DNA fragments (range, 600-1400 bp) encompassing HSS and associated conserved noncoding sequence (CNS) were amplified from the IL-10 locus containing BAC clone RP24-125B12 (Bacpac Resource Center) using primers incorporating MluI at the 5′ end and XhoI or NheI at the 3′ end. The fragments (illustrated as blue bars in Fig. 5⇓) were then cloned into pGL3basic or pGL3promoter (Promega) using restriction sites 5′-MluI and 3′-XhoI or 5′-MluI and 3′-NheI. Clones were sequenced at the Yale Keck Facility (New Haven, CT). Nuclear extracts were prepared according to the method of Dignam et al. (27) from Th1 and Th2 cell cultures differentiated in vitro for 1 wk (25) and then activated at 1 × 106 cells/ml in the presence of PMA (50 ng/ml) and ionomycin (1 μM) for 6 h. EMSA was performed using 5 or 10 μg of protein per sample (quantified with the Bio-Rad protein assay) according to previously published methods (28). Radiolabeled probes prepared with 5′-triple G overhangs were incubated with each sample for 10 min at room temperature. In experiments where competitor cold oligonucleotides (100-fold excess) or Ab were added, samples were preincubated for 15 min at room temperature before probe addition. All oligonucleotides were synthesized in the Yale Keck Facility or purchased from Invitrogen Life Technologies. The NFATc1 and NFATc2 Abs were purchased from Affinity Bioreagents. To examine sequence conservation in the locus, we extracted contig sequence for human (NT_021877.17) and mouse (NT_039180.3) from the Entrez database, masked the sequence for repetitive elements (using Repeatmasker at 〈http://www.repeatmasker.org〉 A. F. A. Smit, R. Hubley, and P. Green) then examined its homology using Blast plus both Pipmaker (29) and Vista (30) alignment programs. The following programs were also used in this analysis: Marscan (31, 32); MarFinder (33); rVista (34); and Consite (35). The approximate locations for murine IL-19 and IL-20 genes were predicted from homology with the cloned human sequence. Primers used for RT-PCR, cloning, and probe preparation are listed in Table I⇓. The real-time primers and probe for HPRT were previously published by Grogan et al. (36). The IL-10 family gene locus spans 145 kb in the mouse genome (Fig. 1⇓A). The backbone of this cluster is conserved in vertebrates because an IL-10 homolog and adjacent gene resembling IL-20 were identified in Tetraodon nigroviridis and Fugu rubripes (37, 38). To examine sequence conservation in the locus, we examined homology between masked murine and human sequence using both local (Pipmaker) (29) and global (Vista) (30) alignment programs. The results using Pipmaker are illustrated in Fig. 1⇓B. A, Schematic of DNase I HSS assay. HSS were detected in a 40-kb region spanning IL-10 and a potential IL-19 exon, using 5′- and 3′-probes from SpeI, NheI, and BamHI restriction fragments. Enzyme cleavage sites relative to the IL-10 gene transcription site (+1) are illustrated. B, Sequence conservation in the IL-10 gene locus. The murine and human genomic sequence were compared using Pipmaker. Regions bearing between 50 and 100% homology (y-axis) to the human sequence are illustrated as dots and dashes along 175 kb (x-axis) of the murine locus. The most CNS (CNS−26) at 134 kb is marked. C, RT-PCR of IL-10 and IL-19. Bone marrow-derived macrophages from BALB/c mice were stimulated with 50 ng/ml LPS for 6, 9, and 24 h. J744 cells were cultured for 6 h with or without 50 ng/ml LPS. T cells from both BALB/c and BL6 spleens were analyzed ex vivo or after Th2 culture for 1 wk. The cluster is flanked by 2 noncytokine genes (not shown): PIGR upstream of IL-24; and MAPKAPK2 downstream of IL-10. There is a hypothetical gene (computer-derived) adjacent to IL-24. The alignment demonstrates that homology exists throughout the region, particularly in regions of ∼10–20 kb flanking each gene (Fig. 1⇑B). A larger 40- to 50-kb region surrounding IL-10 displays extensive interspecies homology. Three of the most CNS (CNS−26, CNS−20, and CNS−9) within the 145-kb locus lie within this region, ∼26, 20, and 9 kb upstream of the IL-10 gene, and 2 overlap CpG islands; hence, in this study, we focused on the 40-kb region surrounding IL-10 and downstream of IL-19. Interestingly, a site homologous to a possible alternative exon 1 reported for human IL-19 (39) also lies within this region (Fig. 1⇑B). Both IL-10 and IL-19 are expressed in murine macrophages but the expression of IL-10 in macrophages is fairly weak when compared with T cells, whereas the reverse is true of IL-19 (Fig. 1⇑C). We also observed very weak IL-19 mRNA expression in T cells (Fig. 1⇑C), notably in BALB/c T cells, which coexhibit a strong IL-10 response, indicating that their transcription could be positively associated at some level. Human studies have concluded that IL-19 and IL-10 are expressed independently, however (40, 41), so it will be interesting to see whether their regulation at the genetic level is coordinated in any manner. For the purpose of this study, we focused on identifying regulatory elements correlated with positive IL-10 expression in the highly conserved locus between these 2 genes, with the proviso these may also regulate IL-19 or alternative genes. We compared an IL-10-negative cell population (ex vivo undifferentiated CD4+ T cells isolated from the spleens of BALB/c mice) with IL-10-expressing Th2 cells (Fig. 1⇑C). We also evaluated HSS in IL-10 T regulatory cell DNA generously provided by M. Saraiva and A. O’Garra (National Institute for Medical Research, Mill Hill, London, U.K.) but found that the HSS pattern observed was the same as that in Th2 cells (data not shown). To identify HSS, we performed a preliminary analysis using both 5′ (S1 and S3) and 3′ (S2 and S4) probes directed against 2 large (20,122 and 14,683 bp) SpeI fragments (Fig. 2⇓, A and B). HSS were absent in undifferentiated CD4+ cells except for one strong site ∼8.8 kb upstream of IL-10 (IL-10HSS−8.8; Fig. 2⇓B). At least 11 sites were present in Th2 cells (shown in Fig. 2⇓), but it was evident during repeats of this experiment that the resolution of the assay was too limited to accurately locate HSS. The assay was subsequently modified to map HSS more accurately using BamHI and NheI, which yield restriction fragments of 10 kb or less (Fig. 1⇑A). In addition, fine mapping of HSS locations relative to enzyme cleavage sites in the locus was performed using Th2 DNA and restriction enzymes that cut at varying distances within the Nhe/BamHI fragments (e.g., Fig. 2⇓C and summarized in Table I⇑). Combining these data, the HSS could be named in a more standardized fashion based on approximate location, i.e., in this case, relative to the +1 transcription start site of IL-10 (±kb) and within chromosome 1. A and B, SpeI analysis of HSS in undifferentiated CD4 and Th2 cells. DNase hypersensitivity analysis was performed on murine BALB/c Th cells before differentiation (resting splenic CD4+) or cultured for 1 wk in vitro under Th2 conditions. All DNase HSS experiments in the study were repeated at least three times with different T cell cultures. Differential IL-10 expression was confirmed with RT-PCR and intracellular cytokine staining data (data not shown). Each SpeI HSS was confirmed using 5′ and 3′ probes (S1–S4). The 5′ and 3′ probe analysis of a 20,122 bp SpeI fragment is shown in A. Results using S3, a 5′ probe for the IL-10 spanning the 14,683-bp SpeI fragment, are shown in B. C, Restriction mapping of HSS location. The assay was redesigned using BamHI and NheI to yield smaller restriction fragments in which to locate HSS. Double digests of BamHI or NheI with the enzymes indicated in C were performed on Th2 DNA and then run alongside Th2 cell DNA treated with an optimal concentration of DNase I to observe HSS location relative to enzyme cleavage sites within the BamHI and NheI restriction fragments. An example of this using BamHI and 5′-probe B1 is shown in C.
The BamHI and NheI analysis of HSS in undifferentiated CD4 and Th2 cells is represented in Fig. 3⇓. The data corroborated that of the preliminary SpeI analysis but resolved more HSS within close proximity of each other. The exception included a number of SpeI sites that were not detected by probe B4 or in regions closest to the BamHI and NheI digestion sites for technical reasons. These nonconfirmed sites were excluded from the analysis. HSS are present in IL-10-producing Th2 cells. DNase I hypersensitivity analysis using BamHI and NheI was performed on undifferentiated (Undiff.) CD4 T cells from BALB/c spleens, and Th2 cells were cultured in vitro for 1 wk, with or without 6 h of PMA-ionomycin (IONO) activation. Differential IL-10 expression was confirmed with RT-PCR and intracellular cytokine staining data (data not shown). A–E, Data obtained using five different probes to four BamHI fragments upstream of IL-10 and a 10-kb NheI fragment spanning IL-10. ∗, These HSS correspond to sites HS promoter, I, II, and III detected by Im et al. (19 ). Because very few HSS were detected in undifferentiated CD4 T cells (IL-10 negative), it is interesting that IL-10HSS−8.8 was actually stronger in undifferentiated T cells (Figs. 1⇑B and 3⇑C). 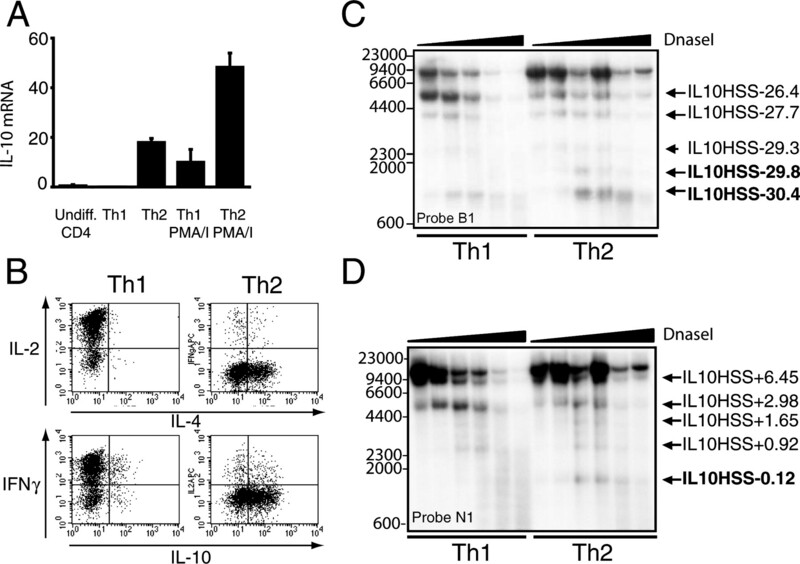 The adjacent site IL-10HSS−9.1 was much stronger in differentiated Th2 cells (Fig. 3⇑C). These two HSS overlap one of the most highly conserved regions in the locus (CNS−9). In addition to five HSS detected in the IL-10 spanning Nhe fragment (Fig. 3⇑E) at the promoter, introns 1, 3, and 4 and 1.5 kb downstream of the 3′-untranslated region, HSS were detected at the most highly conserved site in the locus (CNS−26, 26 kb upstream of IL-10), and in clusters 29–30, 17–21, and 9 kb upstream of IL-10 (summarized in Table II⇓). Activated Th2 cells express higher levels of IL-10 mRNA than primary Th2 cells (see Fig. 4⇓), but we did not observe inducible HSS after PMA-ionomycin stimulation (Fig. 3⇑). This suggests that locus remodeling occurs before active IL-10 protein production and maximal mRNA expression; the IL-10 Th2 locus likely exists in a poised position, ready to produce enhanced mRNA and protein levels upon stimulation. HSS in Th1 and Th2 cells. A, Real-time RT-PCR for HPRT and IL-10 was performed on total RNA from undifferentiated BALB/c CD4 cells and Th1 and Th2 cultures (1 wk differentiation) with or without 6 h of PMA-ionomycin activation. IL-10 mRNA levels were normalized according to HPRT housekeeping gene levels. B, Intracellular cytokine staining for IL-2, IFN-γ, IL-4, and IL-10 was performed in BALB/c Th1-Th2 cells activated for 6 h with PMA-ionomycin. These Th1/Th2 cells were used (without PMA-ionomycin activation) for the HSS analysis illustrated in C and D). HSS were detected using BamHI- or NheI-digested DNA from the Th1 and Th2 nuclear extracts with probes B1–5 and N1. Results for probe B1 (C) and probe N1 (D) are shown. Next, we asked whether the development of HSS in Th2 cells correlated with enhanced IL-10 expression or simply with effector cell differentiation. To do this, we analyzed Th1 and Th2 cells. Low IL-10 mRNA (Fig. 4⇑A) and protein levels (Fig. 4⇑B) were observed in the Th1 cultures (>98% CD4+ by FACS; data not shown) and could be enhanced with PMA-ionomycin activation, but it is known that murine Th1 cells are capable of expressing IL-10, particularly in the BALB/c strain. Nonetheless, IL-10 levels were much higher in Th2 cells. Th1 and Th2 cells yielded similar patterns of hypersensitivity with a few exceptions (Fig. 4⇑, C and D; and summarized in Table I⇑) that may account for enhanced IL-10 expression in Th2 cells. IL-10HSS−29.8 was Th2 specific, and HSS−30.4 was consistently stronger in Th2 than Th1 (Fig. 4⇑C). The most prominent Th2-specific HSS was observed in the IL-10 promoter (IL10HSS−0.12), with probe N1 (Fig. 4⇑D) and B4 (data not shown). The intronic site IL-10HSS+2.98 was visualized in both Th1 and Th2 cultures (Fig. 4⇑D and Table I⇑). Im et al. (19) argued that this site is absent in Th2 cells, which is in direct opposition to our data and that of Saraiva et al. (and recently published in Ref.42 and unpublished observations). However, data from our laboratory show that the site is present in IL-10-expressing cells including Th2 (Figs. 2⇑B, 3⇑E, and 4D) and D10 cells, IL-10 T regulatory cells, and primary macrophages (data not shown). We have found, however, that it is absent in the myeloid cell line J744, which expresses very little IL-10 mRNA (Fig. 1⇑ and data not shown). In Fig. 5⇓A, 40 kb of the murine and human cytokine locus was aligned using the global alignment program Vista (30) to highlight regions of high sequence conservation relative to HSS and repeat sequence. It is apparent that HSS do not coincide exactly with CNS but lie adjacent to regions of high homology. Computer-predicted matrix attachment regions (s/MAR) are also annotated in Fig. 4⇑, because these regions exist adjacent to regulatory sites, bind chromosomal DNA to nuclear matrix and create DNA looping (43); theoretically, this might contribute to chromatin hub formation and gene regulation in the locus. Both IL-10HSS−30.4, and HSS17.3 overlap a predicted MAR binding site. The downstream IL-10HSS+6.45 is flanked by 2 predicted s/MARs. To analyze the functional activity of the HSS and/or corresponding CNS, DNA regions encompassing both (fragments CNS−29.8A, CNS−29.8B, HSS−17.3, etc., depicted as blue bars in Fig. 5⇓A) were assayed for transcriptional function. Identification of conserved HSS enhancer elements. A, Vista plot of murine sequence (x-axis) vs human homology (50% or more, y-axis). Peaks denote CNS; arrows denote HSS. The most highly CNS (−29.8, −26, −20, −9, and +6.45) and intronic sequence (+3) are indicated by peaks (pink) of homology. Computer-predicted s/MAR are shown, and bars CNS−29.8A, −29.8B, etc., indicate regions of DNA tested for transcriptional activity in vitro. Dashed arrows denote HSS that were detected only with SpeI. One of these unconfirmed sites was also observed by Saraiva et al. (42 ). B, Luciferase levels before and after 6 h of PMA-ionomycin activation were measured in D10 cells transfected with pGL3 promoter or test plasmids containing CNS regions, and normalized with Renilla. C, Luciferase levels after 6 h of PMA-ionomycin activation were assayed in both D10 and AE7 cells, normalized with Renilla and then plotted as fold induction (test plasmid/pGL3 promoter control). Each experiment was repeated three times and performed in duplicate. Representative experiments are shown. To test for classical enhancer activity in fragments containing CNS and/or HSS (Fig. 5⇑A), we used a luciferase reporter assay (Fig. 5⇑, B and C) performed in Th2 clone D10 and Th1 clone AE7. Noncoding HSS-CNS fragments were cloned upstream of a minimal promoter-driven luciferase plasmid (pGL3promoter) to determine whether the sites could enhance or repress heterologous promoter activity. We used the minimal SV40 promoter in pGL3promoter to optimize the chance of detecting classical enhancer activity in this study and because, before in vivo analysis, we do not know whether the HSS regulate IL-10 or other cytokine promoters in the region. A representative result assessing the enhancer function of each fragment in D10 cells is illustrated in Fig. 5⇑B. In D10 cells, CNS−26, which represents the largest CNS (273 bp, 88% homology) in the IL-10 family locus, and CNS−9 (the second largest CNS, 259 bp, 84% homology) were the most responsive to PMA-ionomycin activation; i.e., the fold increase in luciferase levels before and after PMA-ionomycin treatment was greatest for CNS−26 and CNS−9. When directly comparing luciferase levels (either with or without activation) between the control plasmid pGL3promoter and the test constructs, it was apparent that CNS−29.8B did not have any significant effect on luciferase transcription. The highest transcriptional responses were observed with CNS−20B, 9, and CNS+6.45, which significantly enhanced PMA-ionomycin-induced transcription 5- to 6-fold over the control pGL3promoter. CNS+6.45, the most potent, could enhance minimal SV40 promoter-mediated transcription 6-fold, irrespective of PMA-ionomycin activation, and encompasses conserved sequence 6.45 kb downstream of the transcription start site for IL-10. CNS−9 includes 1400-bp DNA from 9 kb upstream of IL-10 and enhanced transcription 3- to 5-fold. A shorter, 700-bp fragment of CNS−9 containing only the most conserved sequence was tested and was found to mediate similar affects in the reverse orientation (results not shown), indicating that it is a true enhancer of transcription. The remaining constructs enhanced transcription by a small but consistent degree (2- to 3-fold or less) although the significance of a 2-fold enhancement in this assay is questionable. To determine whether the strongest enhancers CNS−20B, CNS−9, and CNS+6.45 function in both IL-10-expressing (D10) and nonexpressing (AE7) cells, we transfected AE7 and D10 cells. CNS−29.8B was included as a nonresponsive control. The levels of normalized luciferase following PMA-ionomycin activation were assayed and calculated relative to the pGL3 promoter control (fold induction; plotted Fig. 5⇑C). CNS−29.8B functioned similarly to the control, but surprisingly, the enhancer activity of CNS−9 was more than doubled in Th1 cells (unpaired t test, p = 0.045). Conversely, the enhancer activity of CNS+6.45 was reduced by more than one-half in AE7 cells (unpaired t test, p = 0.007) when compared with D10. This is noteworthy because CNS+6.45 was the most potent enhancer in D10. These data indicate that transcriptional activity of CNS−9 and CNS+6.45 is reciprocally enhanced in Th1 and Th2 cells clones. To examine whether significant differences in the enhancer function of CNS+6.45 in AE7 and D10 could be attributed to Th1- and Th2-specific DNA binding of transcription factors, we designed EMSA probes overlapping the most highly conserved sequence (CNS+6.45) of the enhancer fragment (see Fig. 6⇓A). EMSA was performed with nuclear extracts from PMA-ionomycin-activated Th1 or Th2 cells from both BALB/c (Th2-predisposed strain) and C57BL6 (Th1-predisposed strain; hereafter called BL6) mice. Fig. 6⇓B illustrates that Th2 DNA-binding factors bind more strongly to probes CNS+6.45i and CNS+6.45iii. The Th2-specific binding was evident in both BALB/c and BL6 nuclear extracts; thus, it seems unlikely that this mechanism differs between the strains or would account for the enhanced IL-10 expression in the BALB/c strain. Probe CNS+6.45ii (Fig. 6⇓A) failed to bind any factors in this assay (results not shown). EMSA analysis of IL-10CNS+6.45. A, To identify transcription factors capable of binding to the conserved sequence, overlapping probes were designed that encompass the most conserved sequence in the region. B, Nuclear extracts were prepared from Th1 and Th2 cultures stimulated for 6 h with PMA-ionomycin from BALB/c and BL6 mice. EMSA was performed with 10 μg of protein per lane, and radiolabeled probe +6.45i. C, Competitive EMSA was performed with radiolabeled probes +6.45i and +6.45iii to identify the complex binding to these probes. Unlabeled oligonucleotide (100-fold excess) or Abs to NFATc1 and NFATc2 were preincubated with PMA-ionomycin-activated Th2 nuclear extracts before gel shift analysis as indicated in the figure. D, EMSA was performed on PMA-ionomycin-activated Th2 nuclear extracts using a radiolabeled consensus NFAT/AP-1 probe. The samples were competed with 100-fold excess of cold NFAT, AP-1, +6.45i, +6.45iii, and STAT3 oligonucleotide. 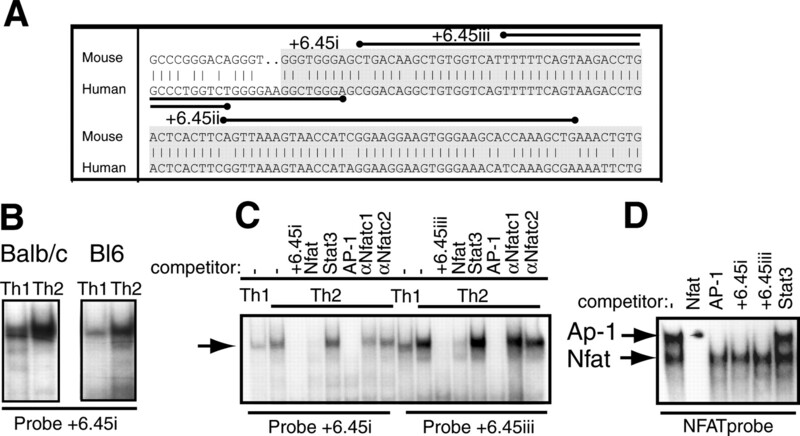 The upper complex of this consensus probe binds to AP-1 and the lower complex to NFAT. To identify the Th2-enhanced binding complex, we chose a panel of oligonucleotides containing common transcription factor binding sites known to be involved in cytokine gene regulation to use for competitor EMSA analysis. Fig. 6⇑C illustrates that probe CNS+6.45i and CNS+6.45iii specifically compete for binding to a protein complex with NFAT/AP-1 and AP-1 consensus oligonucleotides, but not with a STAT3 consensus binding site. Hence, we investigated whether CNS+6.45 binds AP-1 and NFAT in a composite fashion. This was not the case because Abs to NFATc1 and NFATc2 failed to shift the complex binding to CNS+6.45 probes (Fig. 6⇑C). Moreover, using a radiolabeled probe for the composite NFAT/AP-1 site of the IL-2 promoter, it was evident that probes CNS+6.45i and CNS+6.45iii competed the upper AP-1 band of the NFAT probe but not the lower NFAT-containing band (Fig. 6⇑D), indicating that CNS+6.45i/iii bind AP-1 and not NFAT proteins. A similar analysis was performed with CNS−9, which also binds a Th2-specific factor. Because this factor did not compete with binding sites of commonly known transcription factors involved in cytokine regulation (we tested STAT, GATA, NF-κB, NFAT, AP-1, CCAAT/enhancer-binding protein, and SMAD), its identity remains the target of future investigations. Intergenic transcripts have been characterized at regulatory sites in both the β-globin (44) and IL-4 locus (23) and could play an as yet unknown important role in gene regulation. Hence, we searched for the presence of intergenic RNAs in the IL-10 gene locus. Using primers designed to amplify fragments against both conserved and nonconserved regions of the locus, we performed RT-PCR on RNA treated with DNase I to remove genomic DNA contamination. In every experiment, cDNA was amplified in the presence or absence of reverse transcriptase to distinguish between signal amplified from RNA or genomic DNA. Interestingly, both enhancers, CNS+6.45 and CNS−9, express intergenic RNAs (Fig. 7⇓A). The method is only semiquantitative, but when HPRT levels were comparable, we consistently detected RNA at CNS−9 in Th1 and Th2 cells and CNS+6.45 only in Th2 cells. We observed no or very weak expression of RNA at CNS+6.45 in Th1 cells in experiments repeated on four separate T cell cultures (a representative experiment is shown in Fig. 7⇓). Hence, we have consistently observed Th1/Th2 selective differences at CNS+6.45 regarding its enhancer function, ability to bind AP-1, and intriguingly by the expression of intergenic RNA spanning its length. CNS in the IL-10 family locus express intergenic RNA. A, RT-PCR was performed on DNase-treated RNA from BALB/c naive CD4 cells, Th1-Th2 cells cultured in vitro for 5 days and then activated with PMA-ionomycin for 6 h, and primary bone marrow-derived macrophages with or without 4 h of LPS treatment at 50 ng/ml. cDNA reactions were performed with (+RT) or without (−RT) reverse transcriptase. PCR was performed to detect intergenic transcripts spanning sites CNS−9 and CNS+6.45, and with exon-spanning primers to amplify coding sequence IL-10 and housekeeping gene HPRT. B, RT-PCR was performed using primers spanning CNS at sites −29.3, −26, −20; the less conserved regions at HSS −17 or −27.7; and housekeeping gene HPRT (all primers listed in Table I). C, RNA was prepared from the L929 murine fibroblast cell line and treated with DNase before RT-PCR amplification with (C) and without (negative; data not shown) reverse transcriptase. PCR was performed with primers for each intergenic transcript and the coding mRNAs IL-10 and HPRT. D, Assessing promoter activity in HSS-CNS fragments. The combined HSS-CNS fragments used to test enhancer function were cloned into a promoterless luciferase construct (pGL3basic) and transiently transfected into D10 Th2 clones. Luciferase levels before and after 6 h of PMA-ionomycin activation were measured and normalized with Renilla. RT-PCR was also performed on other HSS and conserved regions spanning the locus. It was apparent that all five of the most conserved HSS elements identified in this study (at positions −29.8, −26, −20, −9, and +6.45 relative to the IL-10 gene transcription start site) transcribe intergenic RNA. We did not detect RNA at two additional hypersensitive sites that exhibit less substantial sequence conservation (HSS−17.3 or HSS−27.7). The intergenic RNAs were detected in primary macrophages stimulated in vitro with LPS (Fig. 7⇑A) and in effector T cells (Fig. 7⇑, A and B), indicating that their expression is associated with activated cells, and hence increased IL-10 expression. To confirm this association, we screened for the transcripts in L929 murine fibroblasts, which do not express detectable levels of IL-10 (see Fig. 7⇑C). We were able to detect the intergenic transcripts in L929 cells, but it appears they are present at much reduced levels when corrected for HPRT expression. We next questioned whether the CNS and associated HSS regions encoding RNA possess basic promoter function that could account for RNA transcription at these sites. The same fragments (illustrated in Fig. 5⇑) used to test for enhancer function in pGL3 promoter were cloned into the pGL3basic vector to assay promoter function in the Th2 cell clone D10 (Fig. 7⇑D). This plasmid lacks the minimal SV40 promoter and requires a cloned promoter fragment to drive substantial levels of luciferase transcription. The vector alone can yield low leaky background levels of luciferase activity, but our experiments show that the fragment encoding CNS+6.45 and HSS+6.45 enhances transcription markedly when compared with pGL3basic, with (17-fold above pGL3basic) and without PMA-ionomycin activation (11-fold above pGL3basic). A similar though smaller effect is also observed after PMA-ionomycin activation for fragments CNS−29.8B (4-fold), CNS−20B (5-fold), and CNS−9 (5-fold). This suggests that all four of these fragments possess basic promoter function that could account for intergenic transcription at these sites. Of the five sites displaying intergenic transcription, only CNS−26 (the most conserved sequence in the entire 145-kb locus) failed to drive transcription of luciferase in pGL3basic. There are instances of remarkably high conservation (>80% homology) in the intergenic region between IL-19 and IL-10. This study has extensively mapped clusters of regulatory HSS, determined their transcriptional function in vitro, identified a Th2 specific enhancer, and shown that the conserved region is remodeled during T cell activation in primary cells. Remodeling occurs irrespective of active IL-10 protein expression. Moreover, the data indicate that several HSS are sites of promoter activity that drive intergenic transcription in four of the five most highly conserved sequences. 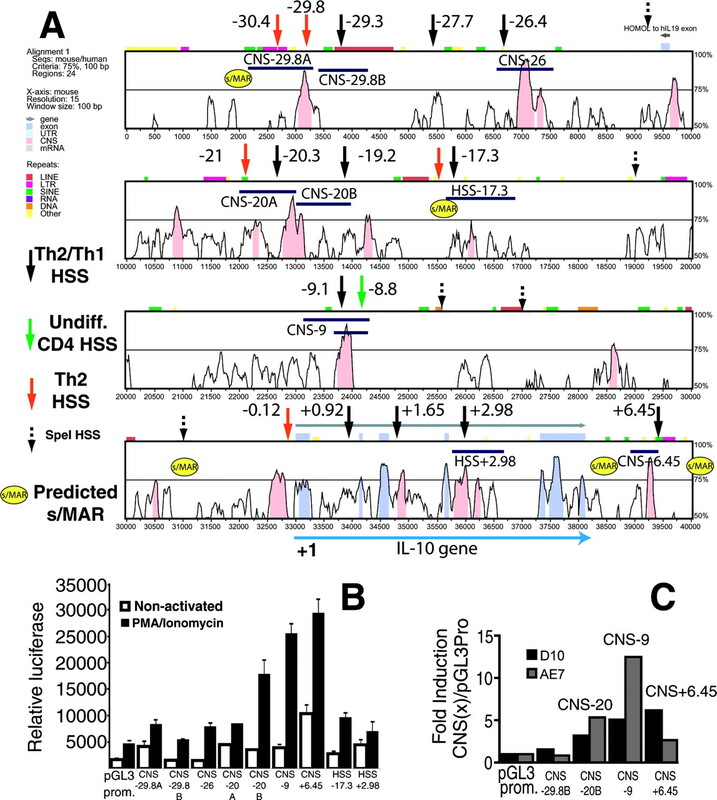 We have yet to determine whether these regulatory elements or intergenic RNAs control cytokine production in vivo, but the lack of DNase I hypersensitivity in resting T cells suggests that chromatin remodeling at these sites is positively associated with a permissive phenotype for IL-10 family cytokine expression. We mapped the location of 17 HSS and associated CNSs in this locus and named them based on location. With one notable exception (IL-10HSS−8.8), the HSS are absent from resting T cells, and we detected a small number of HSS that were stronger in Th2 than Th1 cells. IL-10HSS−29.8 and HSS−30.4 are selectively more hypersensitive in Th2 cells and may drive enhanced cytokine expression in these cells via the overlapping CNS. The CNS is also likely to be an important regulatory site because of the adjacent predicted MAR; regulatory sites are often positioned directly adjacent to MAR, and DNA attachment to the nuclear matrix at this site could contribute to chromatin hub formation. The strongest Th2-specific HSS fell within the IL-10 promoter, suggesting that promoter activity is greater in Th2 cells. Previous reports on IL-10 had concluded that it is regulated primarily at a posttranscriptional level (45, 46), but studies on the Th2 cell clone D10 showed by nuclear run on assay that the rate of transcription is enhanced in Th2 cells (47); the increased promoter DNase I hypersensitivity supports this. In most instances, the location of each HSS was mapped adjacent to the CNS and regions of repeat sequence. Although it is possible that the presumed CNSs actually do encode for unidentified genes or alternative IL-19 exons (as suggested by Gallagher et al. in Ref.39), we have demonstrated that at least three of nine HSS fragments tested mediate reproducible effects (>3- to 4-fold above control) on transcription in the Th2 clone D10. The most potent of these (IL-10CNS+6.45 kb) acts in a Th2-specific manner, because its function was largely reduced in the Th1 clone AE7, and we detected Th2-specific expression of intergenic RNA at the site. Because the site is hypersensitive in both Th1 and Th2 cells, it is likely that the enhancer functions by binding Th2-specific transcription factors or is repressed by Th1-specific factors. We have observed that one of these Th2-specific factors is AP-1 in agreement with Wang et al. (20). Im et al. (19) suggested a role for NFAT in IL-10 gene regulation, but we did not detect composite binding of NFAT within the AP-1 site at CNS+6.45. In contrast, the transcriptional enhancer detected ∼9 kb upstream of the IL-10 gene (IL-10 CNS−9) functioned well in both Th1 and Th2 clones. Intergenic RNA was also expressed in both Th2 cells and Th1 cells at CNS−9. However, the enhancer activity was significantly higher in AE7; and although primary Th1 cultures express low levels of IL-10 mRNA, this cannot be detected in AE7 cells (data not shown), indicating that CNS−9 function might negatively correlate with IL-10 gene expression. Moreover, HSS−8.8 is unique because it was the only HSS detected consistently in undifferentiated T cells; the site could be targeted during initial remodeling within the locus. Because the corresponding CNS is flanked by two HSS, one (IL-10HSS−8.8 kb) present predominantly in non-IL-10-expressing undifferentiated CD4 cells and the other (IL-10HSS−9.1 kb) in Th1-Th2 cells, it is possible that enhancer function is differentially modulated by chromatin remodeling at the two HSS during T cell differentiation. However, the function of CNS−9, CNS+6.45 and other enhancers detected in this study will require in vivo validation to confirm whether they play positive or negative roles on cytokine gene regulation. Output from the phylogenetic footprinting programs rVISTA and Consite suggests that the remaining HSS identified here are enriched with conserved potential transcription factor-binding sites for STAT 3, C/EBP, AP-1, GATA3, Sp1, and CREB but these will have to be determined empirically. All these factors are implicated in the positive regulation of IL-10 promoter activity and cytokine gene expression. An analysis of matrix attachment regions predicted with high probability in both Marscan and MarFinder indicate that HSS −30.4, −17.3 and +6.5 lie close to potential MAR and that these are strong regulatory candidates. The Th2 specific enhancer CNS+6.5 downstream of IL-10 is flanked by two predicted MAR sites that could theoretically precipitate direct interaction between distal regulatory elements through DNA looping. Additionally, HSS−26.4, HSS−17.3, and HSS−9 are all in the vicinity of or overlap CpG islands, which is another strong indicator of regulatory function. The detection of intergenic RNA transcription in the IL-10 family locus is significant as there is growing evidence that RNAs play a much larger functional role in the genome than originally anticipated. However in most of these cases, the RNAs imposed a negative effect on gene expression either through microRNA targeted mRNA degradation and inhibition of translation (48), antisense (49, 50), or small interfering RNA-mediated DNA methylation and epigenetic silencing mechanisms (51). In this study, it is apparent that the transcripts are expressed in activated T cells and macrophages in which cytokine gene expression is up-regulated. It is possible that they silence nonexpressing alleles via the conventional small interfering RNA-based mechanism, but it seems more likely that they have a positive role on gene expression. There are many repeat sequences including SINE elements and L1 transposons that could account for the transcription of RNA in this locus, but we have illustrated that HSS-CNS sequences for four of five sites transcribing RNA possess promoter activity. After this paper was submitted, another group published a study characterizing two HSS, DHSS I and DHSS II in D10 and AE7 cell clones (20). DHSS I coincides with IL-10HSS+6.45 identified in primary Th1 and Th2 cells and the Th2-specific enhancer CNS+6.45. Independently, Wang et al. also found that AP-1 (c-Jun and JunB) binds selectively to the conserved sequence in this region in Th2 cells and demonstrated that c-Jun and JunB can regulate PMA-ionomycin-induced IL-10. Our findings are consistent with theirs, but we have also observed activation-independent enhancer and promoter activity at CNS+6.45. Although our work agrees with that of Wang et al. (20), we and Saraiva et al. (42) observed a discrepancy between independent data from our two groups with data recently published by Im et al. (19). Im’s group identified six HSS spanning the IL-10 gene (four matching our data and annotated in Fig. 3⇑ and Table I⇑) and concluded that HSS+2.98 is Th1 specific. Although our primary cultures inevitably contain some heterogeneity, is it is unlikely that any minor contaminating cell population would account for the strong HSS+2.98 we consistently detected in cells associated with active IL-10 expression, including Th2 and Th1 cells. We used a broad approach combining both bioinformatics and empiric data to identify distal regulatory sites in the IL-10 family locus, instead of focusing heavily in the coding region. Our hypothesis is that in both the IL-4 and IL-10 loci, intervening DNA between IL-10 and IL-19 or IL-13 and IL-5 contains critical locus-regulatory elements capable of mediating coordinate regulation of each cytokine in the locus. The finding that intergenic RNA is transcribed in this locus with Th1-Th2 specificity as well as in the IL-4 locus confirms that this phenomenon is likely to play a general role in cytokine gene regulation. Recent findings of regulatory elements interacting physically over long distances (2, 21, 22, 52) indicate that either structural changes must occur to create DNA looping or that elements interact because each region is colocalized at the same site in the nucleus. It is possible that the RNAs function by altering DNA structure at enhancer regions, creating the topological changes required to mediate long distance interactions during chromatin hub formation. Alternatively, they may recruit the locus to an active site of transcription at the nuclear matrix or periphery (53, 54) as reported for the giant transcript of the α-globin locus (55). Our priority is to determine which of the regulatory sites are critical for IL-10 family cytokine regulation in vivo, exactly how they achieve this, and whether they do so through these intergenic RNAs. We thank M. Saraiva and A. O’Garra who cosubmitted their study on HSS in the IL-10 gene and provided us with IL-10 T regulatory cell DNA. We also thank Judy Stein for technical advice, Patrick Fields for critiquing the manuscript, and Fran Manzo for administrative assistance. ↵1 This work was supported by a National Psoriasis Foundation Fellowship award (to E.A.J.) and a National Institutes of Health-funded National Institute of Allergy and Infectious Diseases Grant AI 36529 (to R.A.F.). R.A.F. is an investigator of the Howard Hughes Medical Institute. ↵3 Abbreviations used in this paper: HSS, DNase I-hypersensitive site; CNS, conserved noncoding sequence; HPRT, hypoxanthine phosphoribosyltransferase; s/MAR, computer-predicted matrix attachment region. Spilianakis, C. G., M. D. Lalioti, T. Town, G. R. Lee, R. A. Flavell. 2005. Interchromosomal associations between alternatively expressed loci. Nature 435: 637-645. Moore, K. W., R. de Waal Malefyt, R. L. Coffman, A. O’Garra. 2001. Interleukin-10 and the interleukin-10 receptor. Annu. Rev. Immunol. 19: 683-765. Roncarolo, M. G., M. Battaglia, S. Gregori. 2003. The role of interleukin 10 in the control of autoimmunity. J. Autoimmun 20: 269-272. Eskdale, J., V. Keijsers, T. Huizinga, G. Gallagher. 1999. Microsatellite alleles and single nucleotide polymorphisms (SNP) combine to form four major haplotype families at the human interleukin-10 (IL-10) locus. Genes Immun. 1: 151-155. Kube, D., H. Rieth, J. Eskdale, P. G. Kremsner, G. Gallagher. 2001. Structural characterisation of the distal 5′ flanking region of the human interleukin-10 gene. Genes Immun. 2: 181-190. Köks, S., K. Kingo, R. Ratsep, M. Karelson, H. Silm, E. Vasar. 2004. Combined haplotype analysis of the interleukin-19 and -20 genes: relationship to plaque-type psoriasis. Genes Immun. 5: 662-667. Kim, J. M., C. I. Brannan, N. G. Copeland, N. A. Jenkins, T. A. Khan, K. W. Moore. 1992. Structure of the mouse IL-10 gene and chromosomal localization of the mouse and human genes. J. Immunol. 148: 3618-3623. Ma, W., W. Lim, K. Gee, S. Aucoin, D. Nandan, M. Kozlowski, F. Diaz-Mitoma, A. Kumar. 2001. The p38 mitogen-activated kinase pathway regulates the human interleukin-10 promoter via the activation of Sp1 transcription factor in lipopolysaccharide-stimulated human macrophages. J. Biol. Chem. 276: 13664-13674. Brightbill, H. D., S. E. Plevy, R. L. Modlin, S. T. Smale. 2000. A prominent role for Sp1 during lipopolysaccharide-mediated induction of the IL-10 promoter in macrophages. J. Immunol. 164: 1940-1951. Ziegler-Heitbrock, L., M. Lotzerich, A. Schaefer, T. Werner, M. Frankenberger, E. Benkhart. 2003. IFN-α induces the human IL-10 gene by recruiting both IFN regulatory factor 1 and Stat3. J. Immunol. 171: 285-290. Mori, N., D. Prager. 1997. Activation of the interleukin-10 gene in the human T lymphoma line HuT 78: identification and characterization of NF-κB binding sites in the regulatory region of the interleukin-10 gene. Eur. J. Haematol. 59: 162-170. Brenner, S., S. Prosch, K. Schenke-Layland, U. Riese, U. Gausmann, C. Platzer. 2003. cAMP-induced Interleukin-10 promoter activation depends on CCAAT/enhancer-binding protein expression and monocytic differentiation. J. Biol. Chem. 278: 5597-5604. Huang, Y., T. Li, D. C. Sane, L. Li. 2004. IRAK1 serves as a novel regulator essential for lipopolysaccharide-induced interleukin-10 gene expression. J. Biol. Chem. 279: 51697-51703. Kitani, A., I. Fuss, K. Nakamura, F. Kumaki, T. Usui, W. Strober. 2003. Transforming growth factor (TGF)-β1-producing regulatory T cells induce Smad-mediated interleukin 10 secretion that facilitates coordinated immunoregulatory activity and amelioration of TGF-β1-mediated fibrosis. J. Exp. Med. 198: 1179-1188. Blokzijl, A., P. ten Dijke, C. F. Ibanez. 2002. Physical and functional interaction between GATA-3 and Smad3 allows TGF-β regulation of GATA target genes. Curr. Biol. 12: 35-45. Madireddi, M. T., P. Dent, P. B. Fisher. 2000. AP-1 and C/EBP transcription factors contribute to mda-7 gene promoter activity during human melanoma differentiation. J. Cell Physiol. 185: 36-46. Im, S. H., A. Hueber, S. Monticelli, K. H. Kang, A. Rao. 2004. Chromatin-level regulation of the IL10 gene in T cells. J. Biol. Chem. 279: 46818-46825. Wang, Z. Y., H. Sato, S. Kusam, S. Sehra, L. M. Toney, A. L. Dent. 2005. Regulation of IL-10 gene expression in Th2 cells by Jun proteins. J. Immunol. 174: 2098-2105. Patrinos, G. P., M. de Krom, E. de Boer, A. Langeveld, A. M. Imam, J. Strouboulis, W. de Laat, F. G. Grosveld. 2004. Multiple interactions between regulatory regions are required to stabilize an active chromatin hub. Genes Dev. 18: 1495-1509. Spilianakis, C. G., R. A. Flavell. 2004. Long-range intrachromosomal interactions in the T helper type 2 cytokine locus. Nat. Immunol. 5: 1017-1027. Rogan, D. F., D. J. Cousins, S. Santangelo, P. A. Ioannou, M. Antoniou, T. H. Lee, D. Z. Staynov. 2004. Analysis of intergenic transcription in the human IL-4/IL-13 gene cluster. Proc. Natl. Acad. Sci. USA 101: 2446-2451. Lee, G. R., P. E. Fields, T. J. Griffin, R. A. Flavell. 2003. Regulation of the Th2 cytokine locus by a locus control region. Immunity 19: 145-153. Kieffer, L. J., L. Yan, J. H. Hanke, P. B. Kavathas. 1997. Appropriate developmental expression of human CD8β in transgenic mice. J. Immunol. 159: 4907-4912. Dignam, J. D.. 1990. Preparation of extracts from higher eukaryotes. Methods Enzymol. 182: 194-203. Jones, E. A., D. Sun, L. Kobierski, A. J. Symes. 2003. NFAT4 is expressed in primary astrocytes and activated by glutamate. J. Neurosci. Res. 72: 191-197. Schwartz, S., Z. Zhang, K. A. Frazer, A. Smit, C. Riemer, J. Bouck, R. Gibbs, R. Hardison, W. Miller. 2000. PipMaker: a web server for aligning two genomic DNA sequences. Genome Res. 10: 577-586. Bray, N., I. Dubchak, L. Pachter. 2003. AVID: A global alignment program. Genome Res. 13: 97-102.
van Drunen, C. M., R. G. Sewalt, R. W. Oosterling, P. J. Weisbeek, S. C. Smeekens, R. van Driel. 1999. A bipartite sequence element associated with matrix/scaffold attachment regions. Nucleic Acids Res. 27: 2924-2930. Rice, P., I. Longden, A. Bleasby. 2000. EMBOSS: the European Molecular Biology Open Software Suite. Trends Genet. 16: 276-277. Singh, G. B., J. A. Kramer, S. A. Krawetz. 1997. Mathematical model to predict regions of chromatin attachment to the nuclear matrix. Nucleic Acids Res. 25: 1419-1425. Loots, G. G., I. Ovcharenko, L. Pachter, I. Dubchak, E. M. Rubin. 2002. rVista for comparative sequence-based discovery of functional transcription factor binding sites. Genome Res. 12: 832-839. Zou, J., M. S. Clark, C. J. Secombes. 2003. Characterisation, expression and promoter analysis of an interleukin 10 homologue in the puffer fish, Fugu rubripes. Immunogenetics 55: 325-335. Gallagher, G., H. Dickensheets, J. Eskdale, L. S. Izotova, O. V. Mirochnitchenko, J. D. Peat, N. Vazquez, S. Pestka, R. P. Donnelly, S. V. Kotenko. 2000. Cloning, expression and initial characterization of interleukin-19 (IL-19), a novel homologue of human interleukin-10 (IL-10). Genes Immun. 1: 442-450. Nagalakshmi, M. L., E. Murphy, T. McClanahan, R. de Waal Malefyt. 2004. Expression patterns of IL-10 ligand and receptor gene families provide leads for biological characterization. Int. Immunopharmacol. 4: 577-592. Saraiva, M., J. R. Christensen, A. V. Tsytsykova, A. E. Goldfeld, S. C. Ley, D. Kioussis, A. O’Garra. 2005. Identification of a macrophage-specific chromatin signature in the IL-10 locus. J. Immunol. 175: 1041-1046. Yasui, D., M. Miyano, S. Cai, P. Varga-Weisz, T. Kohwi-Shigematsu. 2002. SATB1 targets chromatin remodelling to regulate genes over long distances. Nature 419: 641-645. Ashe, H. L., J. Monks, M. Wijgerde, P. Fraser, N. J. Proudfoot. 1997. Intergenic transcription and transinduction of the human β-globin locus. Genes Dev. 11: 2494-2509. Le, T., L. Leung, W. L. Carroll, K. R. Schibler. 1997. Regulation of interleukin-10 gene expression: possible mechanisms accounting for its upregulation and for maturational differences in its expression by blood mononuclear cells. Blood 89: 4112-4119. Powell, M. J., S. A. Thompson, Y. Tone, H. Waldmann, M. Tone. 2000. Posttranscriptional regulation of IL-10 gene expression through sequences in the 3′-untranslated region. J. Immunol. 165: 292-296. Naora, H., I. G. Young. 1995. Comparison of the mechanisms regulating IL-5, IL-4, and three other lymphokine genes in the Th2 clone D10.G4.1. Exp. Hematol. 23: 597-602. Ambros, V.. 2004. The functions of animal microRNAs. Nature 431: 350-355. Sleutels, F., R. Zwart, D. P. Barlow. 2002. The non-coding Air RNA is required for silencing autosomal imprinted genes. Nature 415: 810-813. Reis, E. M., R. Louro, H. I. Nakaya, S. Verjovski-Almeida. 2005. As antisense RNA gets intronic. OMICS 9: 2-12. Lippman, Z., R. Martienssen. 2004. The role of RNA interference in heterochromatic silencing. Nature 431: 364-370. Tolhuis, B., R. J. Palstra, E. Splinter, F. Grosveld, W. de Laat. 2002. Looping and interaction between hypersensitive sites in the active β-globin locus. Mol. Cell 10: 1453-1465. Casolari, J. M., C. R. Brown, D. A. Drubin, O. J. Rando, P. A. Silver. 2005. Developmentally induced changes in transcriptional program alter spatial organization across chromosomes. Genes Dev. 19: 1188-1198. Misteli, T.. 2004. Spatial positioning; a new dimension in genome function. Cell 119: 153-156. Razin, S. V., A. Rynditch, V. Borunova, E. Ioudinkova, V. Smalko, K. Scherrer. 2004. The 33 kb transcript of the chicken α-globin gene domain is part of the nuclear matrix. J. Cell Biochem. 92: 445-457.